The afternoon of August, 7th, 2018 at Kings Fork Middle School during the National Night Out event, was one of the hottest and most humid days in recent memory. 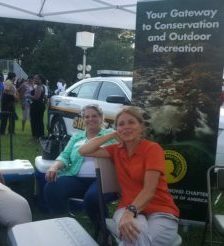 In this fierce heat, Wanda Gerard coordinated/manned an informational booth with assistance from several Chapter Ikes. Shown in this photo from left to right are Joyce Dugan, and Beverly Snyder. Not shown, but also helping Wanda out included Gerard, Greg Metzger, as did Ray and Claudia Powell who provided the popup tent for some well-needed shade, and Jimmy Fanny who brought ice for the coolers. The kids and their parents who dropped by our chapter’s booth were most appreciative as we gave out free cold bottled water, juice packs, and assorted IWLA “freebies” including coloring books, informational pamphlets, and magazines. Wanda had on display recent chapter scholarship award photos and a colorful IWLA backdrop canvas. 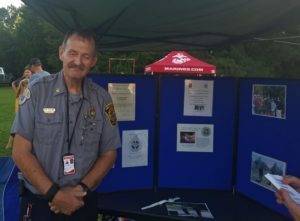 We saw many familiar faces at this event, including our own Chapter Ike Mason Copeland who was hosting a separate booth for the Suffolk Fire & Rescue department. Mason remarked that the backdrop display shown in this photo contains an award for his department for their recent rescue of an autistic child. 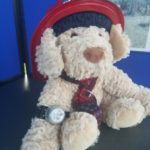 On display at the table was one of the donated rescue bears that they use to help keep kids calm. Also, Mason talked about the increased usage of drones in his work. 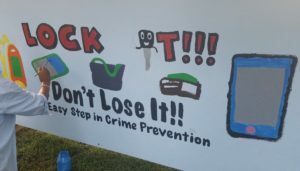 We spoke with Wayne Jones, Suffolk-Litter Control Coodinator, who was coordinating a mural painting in the lawn area right across from our chapter booth. He invited us to don aprons so we could help paint the mural underway (shown here in this photo still under construction), but the kids were having so much fun painting we decided to just watch instead. Although this is the first time our chapter has participated in this event, we hope that this will be a tradition that we can continue for years to come, as it helps spread the word about our local chapter, and how we are working alongside other community groups to foster progress in environmental conservation and in educating people about clean air, water, wildlife, woods, and open spaces.